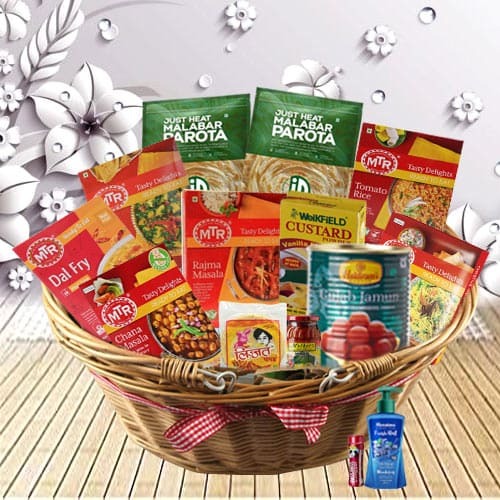 Tighten the bonds of your relationship by ordering online this Delicious Flavor-Full North Indian Dishes Dinner Hamper for your loved ones and give them a reason to love you more. The recipient will feel happy when they receive this very attractive, high-end, gourmet Gift Basket filled with a Punch of 350 gr. Id Just Heat Malabar Parota- 2 Pcs., a Carton of 300 gr. MTR Ready To Eat Tomato Rice, a Carton of 300 gr. MTR Ready To Eat Rice Pulao, a Carton of 300 gr. MTR Ready To Eat Alu Methi, a Carton of 300 gr. MTR Ready To Eat Dal Tadka, a Carton of 285 gr. MTR Ready to Eat Rajma, a Carton of 285 gr. MTR Ready to Eat Pindi Chana, a Tin of 1 Kg. Haldirams Gulab Jamun, Weikfield Custard Mix, Water Himalaya Fresh, Mothers Mixed Pickle, a Punch of 200 gr. Mini Lijjat Papad and Mouth Freshener Pass Pass.